It’s mid-January and most of you have probably dismantled the Christmas tree. But if you are one of those people that is wondering what the best option is for storing all things Christmas, this post is for you. First, let’s start with our first challenge: Decorations! Ugh, I need to get the box from the basement/attic/ storage and find XYZ to check if it’s still working and then put it up. Then in 3 weeks I have to take it down and figure out how to store it, again. I just don’t want to deal with it. The key to a stress free and easy holiday decoration process is organization. Take advantage of premade storage, such as specially made boxes for your ball ornaments. 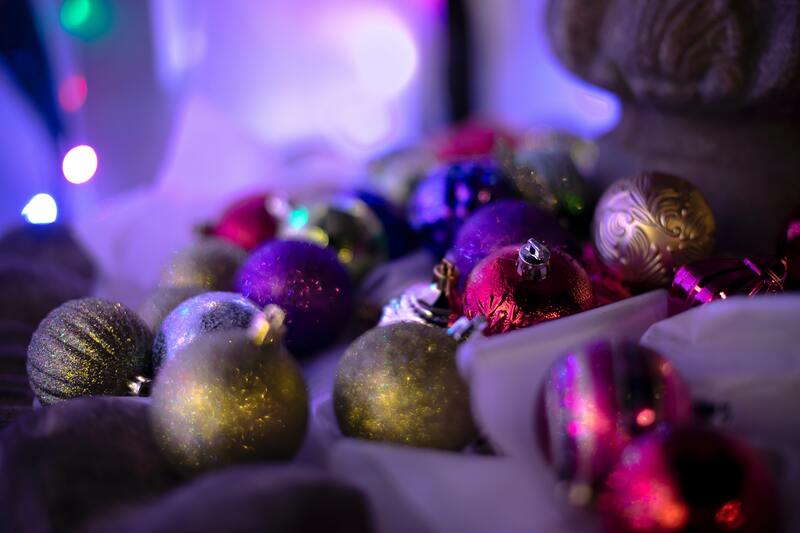 Store any “gap filler” ornaments together, so they are ready to go for the following year. Separate smaller and fragile items from the bulkier ones. Wrap the decorations in paper (for a green option, reuse tissue paper from gifts!). I’ve used bubble wrap, per client’s request, but I find, for the extra cost and bulk, it doesn’t protect any better than well wrapped paper. A major challenge that almost everyone encounters, including me, is dealing with the Christmas lights. Rule #1: Always check to see if the lights are working BEFORE you put them on the tree! Rule #2: Be extra careful not to step on the lights when they are on the ground while trying to put them up! Putting the lights up is easy, especially if they are brand new, the problem occurs when it’s time for them to come down. The best way to store them is to have them wrapped around cardboard, old magazine, newspapers, etc. That way next year you just unroll the string while you are going around the tree. Let’s talk about storage options. My advice is to make sure to get something that is a good size for you to carry. When selecting a storage bin, make sure it is not too large for you to move on your own. Don’t forget to take the weight of the decorations into account! Both have their advantages. If you have plenty of cardboard boxes you want to utilize and save money over plastic, sure, why not!? BUT, if your storage space is not insulated and/or there is the possibility of moisture in the air I strongly recommend getting the plastic boxes. For best deals on those, wait a week or two after the end of the holiday season, most retailers that offer storage containers are trying to move them off their shelves, so they have discounts. Last point I want to touch on is WHERE to store the decorations. Make sure not to place them in direct sunlight (such as under a window) as it will most likely it will result in discoloration. Take special care with clear plastic bins, as they will let in light. And here you have it folks, few easy steps to follow when handling decorations, for any occasion really. January is a busy month for professional organizers because most people want to transform their homes. But if big sudden changes are not your thing, starting small, like organizing your holiday decor, can set you up for even better and more fun holiday season next year! As always, for any help with your organizational projects, give us a call. Previous Previous post: Set the right intentions for the year!